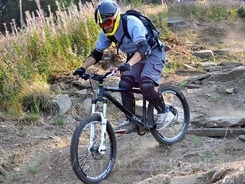 Chepelare constructs a mountain bike park close to ski centre Mechi chal. The project will be supported by government fund “Agriculture”. The government will provide 387 352 BGN financial support. The project was presented in the program for the development of the rural regions 2007-2013. The new sport infrastructure will attract more tourists during the summer season. Chepelare aims to become a year round tourism destination by diversifying the sport and relaxation attractions in the region.